As far as signature drinks are concerned, Singapore has an alliterative gem with the Singapore Sling. However, I’d heard about the emerging craft beer scene in Singapore and I was eager to sample the suds on this shiny city offers. After a morning of wandering around town, I headed to Brewerkz Riverside Point. Situated on the river (as the name suggests), this restaurant and brewery has a large selection of craft beer from seasonal (a Honey Apricot Ale and a Belgian Pale Ale, to name a few) to signature brews (the Oatmeal Stout looked tasty) and is an ideal location for enjoying the breeze on a hot day. I tried the XIPA, a World Beer Cup Gold Medal Winner, which was excellent. A balanced blend of malt and hops, it’s big and bold but not overpowering. Of course, the 7.5% abv isn’t too shabby, either, but all in all it’s a great pint to sample and watch the people go by. Brewerkz also pours a few beers from other breweries and I was eager to try the Tropical Wheat from Jungle Beer. A small craft brewery that uses local ingredients, Jungle Beer is making a name for itself with concoctions like Tropical Wheat (choose from Mango & Orange, Mango & Rose and Pink Guava and Soursop) and a Belgian blonde ale with pineapple, cardamom and sour plum. I tried the Mango & Orange Tropical Wheat and it was mighty tasty. Not too sweet, it carried the best parts of the fruit flavor without being overpowering. I wish it were available in the US as it’s a great summer beer. Also located in Clark Quay is the Pump Room, a microbrewery/club. I tried one of their Scottish Ales while waiting for a friend. It was good, but not anything extraordinary in the world of Scottish Ales. However, the Pump Room is an excellent venue for people-watching at Clark Quay. 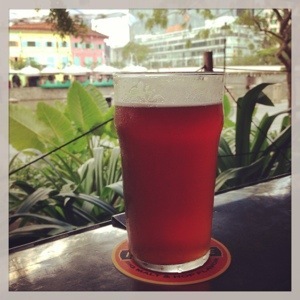 Though not a craft beer, the Tiger Brewery is located in Singapore and is open for tours. It’s a pretty good ways out of the city, so allot an hour or two to get there with public transportation. The tour is 45 minutes and there is a 45 minute “beer appreciation session” after the tour. I didn’t make it out there, so I can’t comment on the quality of the tour, but I did drink a lot of Tiger during my time in Singapore and Malaysia. Beer, like just about everything in Singapore, is more expensive than in other Asian countries–in a bar in Clark Quay, you can expect to pay anywhere from $16-$20 SGD ($11.25 – $16 USD) per pint. As a result, happy hour is a good thing and many bars have happy hour specials. 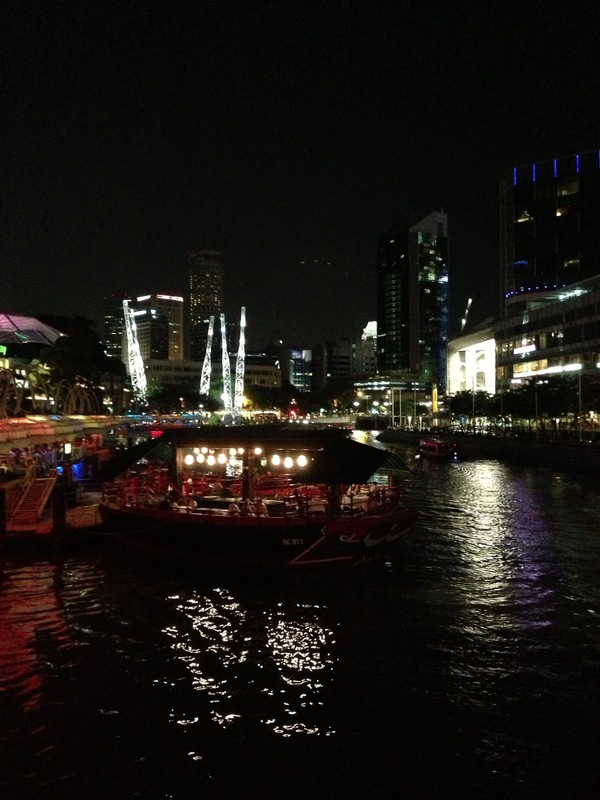 My favorite spot for beer in Singapore, though, is the party bridge. Stretching over Clark Quay, this bridge has a wide support where, at night, groups perch and socialize. Conveniently, there’s a tiny 7/11 convenience store on the far side of the bridge that sells Tiger beer for $8SGD. It’s an experience in and of itself to clamber up on the side of the bridge, open a can and watch life in Singapore stroll by. 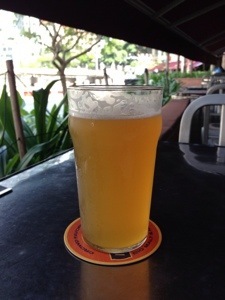 Tags: clark quay, craft beer, Singapore, travel. Bookmark the permalink.